Here, after the emotional blow of the 3rd X Men installment, Logan has removed himself from society. With dreams and nightmares entwined, he is sought from his wilderness hideout by a Japanese girl. He is reunited with an ex-Japanese soldier he saved during the Nagasaki atomic bomb in WWII. In Japan, now on his death bed, the wealthy man has a proposition for the indestructible Logan / Wolverine to become mortal. But things smell like far more than a rat when his granddaughter's life is in danger. Logan protects her and they go in hiding, but death is hot on their heels. Some of the adult moments and violence sometimes seem a bit intense for the age restriction. Interesting choice in Monster's Ball & 007 director James Mangold to helm this... 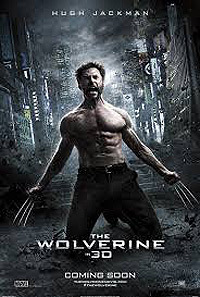 But as with SA director Gavin Hood handling the first Wolverine Origins solo flight, the producers seem to look for directors who can dig into the characters, as the mechanisms to make the action explosive is already in place with stunt co-ordinators, special FX crews, CGI teams etc. I feel they had the opportunity to really make use of 3D here for the cinema, but as usual, only a few moments really pop out, making it lackluster at best.